I'm not sure I was all that anxious to revisit the sixth and final season of Hogan's Heroes when it arrived at my door. I had already written a lengthy examination of the series for Season Five (please click here if you would like to read that review), and one of the main points of that piece was the curious nature of the show's sameness. Often times, unless you're a real Hogan's Heroes fan - and there are a lot of them - it's difficult to distinguish one season from the next. The episodes are incredibly similar, with a basic plot theme of Hogan and his commandos executing daring, and frequently ridiculous, sabotage and espionage activities right under the noses of their German captors at Stalag 13. Week after week, season after season, this was the basic set-up for each episode of Hogan's Heroes. Now, that's really not a knock against the show's producers and writers; on the contrary, as I stated in that first review, I have nothing but admiration for the ingenious ways that the creators of Hogan's Heroes continued to keep the ball rolling for six seasons when they were severely limited by the show's premise. That being said, Hogan's Heroes was a great show to watch when I was a kid, and I enjoyed revisiting it a few months ago, but another go-around? I wasn't so sure; after all, what was going to change? And then it struck me as I watched this final season: Hogan's Heroes may be the perfect embodiment of what light, fun, escapist TV should be -- regardless of what some people claim about its subject matter. "Perfect" not because it's a superior product to genuine art like The Honeymooners or All in the Family; it's a funny, speedy show, and amusing for what it is - but "art?" No, I'm talking about its format; it's structure. It's that very sameness that starts to work in its favor. Hogan's Heroes is safe; it's unchanging. The plots will always be the same, season to season. Hogan and his men will always put one over on criminally gullible Schultz and Klink; their sabotage efforts will always succeed; and the true realities of WWII will never enter the gates of Stalag 13. 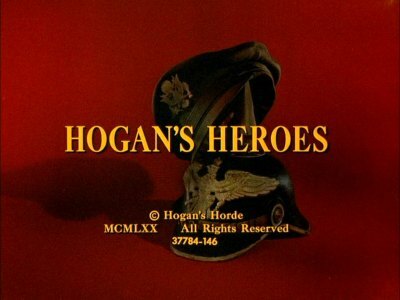 Season after season, Hogan's Heroes stays eternal; I for one am glad they never did a final wrap-up episode (much like Gilligan's Island) because regardless of whether you're catching a season one episode or one from this last sixth season, you already know the score. You're going to get what you want out of Hogan's Heroes: compact little spy dramas set within humorous screenplays, as cleanly and professionally executed as one of Hogan's operations, with an excellent cast of farceurs who knew their business the first day on the set, and the last. Of course, there are those who cringe at such a suggestion that would award recognition to anything so commercial and "cookie-cutter" as Hogan's Heroes, but I disagree. We watch TV for all sorts of different reasons, and putting down something just because it's escapist or formulaic smacks of snobbery (or maybe just plain grumpiness). It also ignores the fact that we bestow those elusive, sometimes meaningless terms such as "art" and "junk" most indiscriminately. 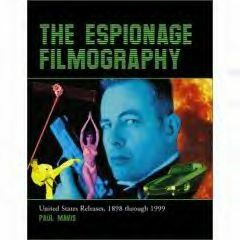 Fifty years ago, a second-bill Touch of Evil or Thunder Road were considered strictly exploitation fare, while "prestige" pictures like The Inn of the Sixth Happiness or Marjorie Morningstar were considered "important. Which ones are considered "art" now? I don't want to make too much out of Hogan's Heroes; it is what it is. What I admire about it is its consistency. And that's a virtue for entertainment TV. That being said, there was one major change in this final season of Hogan's Heroes: the loss of Ivan Dixon as Sergeant James "Kinch" Kinchloe, to be replaced by another black actor, Kenneth Washington, as Sergeant Richard Baker. It's an odd break for the series' steady continuity, not aided by the fact that the producers never address Kinch's absence. Last season he was there; now, he's replaced by a rather anonymous character. It was a lame - and not to mention insulting - attempt by the producers to smooth over Dixon's departure. Too bad, too; Dixon lent a certain solidity to his scenes, offsetting the more rambunctious supporting characters. Still, the rest of the actors are all still surprisingly nimble with their line readings (although Crane does look at times rather preoccupied), with Klemperer a stand-out, still managing to wring out big laughs with his familiar character. There's a marvelous scene in Klink's Masterpiece where Klink comes upon the men putting together a torn-up secret map. Told it's a jigsaw puzzle by Hogan, Klink studies it for minutes, with the audience sure that Kink has finally figured out one of Hogan's schemes. Instead, Klink quietly picks up a piece of the map, and says, "That belong here." and places it in its correct position -- it's a brilliant line reading by Klemperer. 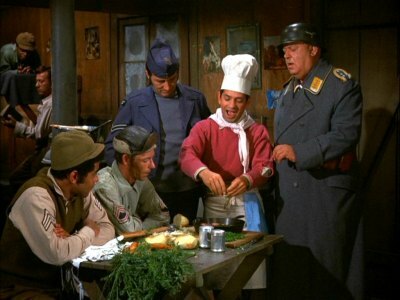 Watching Hogan's Heroes: The Sixth and Final Season, an almost endearing quality came through the usual antics at Stalag 13. The series, which had been steadily dropping in the ratings since its second year, was nowhere to be found in the Nielsen Top Thirty in 1970-1971, so it's probably safe to assume the actors knew this might be their last go around. Watching their interactions during the episodes (such as The Gestapo Takeover), a reliance on each other - Hogan and Klink - comes through, a teaming up against the harsher realities of the outside world, is evident. It becomes almost sad, in a way. Neither, in the context of the story, can exist without the other. Hogan wouldn't be able to pull off his jobs with a competent Commandant at the helm of Stalag 13, and Klink would more than likely be shot or sent to the Russian front for his incompetency, which is masked by Hogan's efforts. I despise the word "co-dependent," but it almost fits here for the men of Stalag 13, made more poignant knowing this is the final season of the show, and particularly when you take into account the rocky waters of Crane's subsequent career after Hogan's Heroes, and his tragic, seedy death. It lends just a suggestion, but an inescapable one, of melancholy to this final season of Hogan's Heroes. Colonel Hogan need LeBeau to whip up something special for a German general, but the chef has made plans to escape to France. 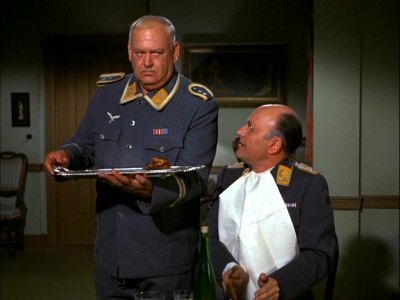 When the Gestapo targets Colonel Klink's radio expert, Hogan helps save him before he's silenced for good. Hogan convinces Klink that he's a great artist so he can smuggle out some maps in the commandant's canvases. When Sir Charles Chitterly parachutes into Stalag 13, Hogan asks Colonel Crittendon to pretend he's Sir Charles -- but Lady Chitterly isn't fooled. Hogan fears the phony Sir Charles can't trick Hitler. Things get even more complicated when Chitterly escapes from the prisoners' tunnel. When Schultz is put in command, his mania for power jeopardizes Hogan's plan to smuggle uranium to London. Right after he tells a new prisoner about their secret operations, Hogan discovers he's a German spy. Hogan's plot to hijack a dynamite truck takes a different tack when the truck makes an unscheduled stop. Hogan and his men mastermind the ambush of a Gestapo train that's transporting an underground agent to Berlin. The heroes use Klink's car radio to pass information to an underground agent about a German rocket factory. To smuggle out an anti-radar device, Hogan passes LeBeau off as a fortune-teller after convincing Klink he's been struck by lightning. When three Gestapo officers detain Hogan and Carter, the two frantically plan their escape -- until they learn the officers want to defect. Klink takes Hogan to England to steal an Allied plane, but Hogan has other plans -- to expose some Nazis spies. The heroes pose as Nazis officers to root out a German spy posing as an American pilot. Dresses as a general's wife, Newkirk attends a tea party to deliver penicillin to an underground leader. Top get ahold of secret papers, Hogan enlists a beautiful Russian spy to convince Klink he's needed at the Russian front. When Klink gets assigned to defend a German officer accused of treason, Hogan helps to prove his innocence. When a rocket lands near camp, the heroes don't know how they'll smuggle it out -- until Russian spy Marya comes on the scene. General Berkhalter's sister Gertrude thinks her dim-witted fiance should be made Klink's assistant, which interferes with Hogan's plan to aid an American general. When Gestapo agents accuse Hogan of sabotage, he explains that his exact double, a German traitor, is the real culprit. The full screen video image for Hogan's Heroes: The Sixth and Final Season looks great. Sure there are some scratches and dirt, but overall, this 35mm-shot series looks as good as feature films from that period. I saw no transfer issues. The Dolby Digital English 2.0 mono soundtrack accurately reflects the original broadcast presentation. Close-captioning is available. No luck here, fans. No extras. Never-changing, yet never lagging, either, Hogan's Heroes: The Sixth and Final Season is more of the same, and that's fine for fans. In fact, the ingenious ways the writers and producers keep Hogan and his men occupied behind Stalag 13's wire is pretty admirable. And the cast excels at their well-honed roles, too. 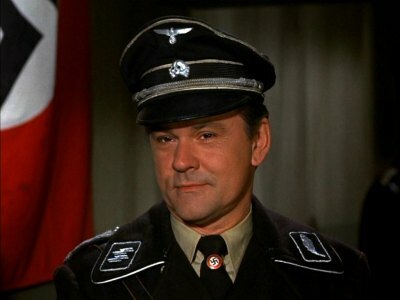 I recommend Hogan's Heroes: The Sixth and Final Season.